The “right” shoes for percussive dance can be a confusing subject, even for seasoned dancers. Taps? Leather-soles? How much should I spend? Which brands or makers are the best? How heavy should this sole be? Is a solid sole or split sole better? With all this in mind, here is some info aimed at prospective dance shoe-shoppers and other interested parties. Many dance forms have a specific shoe, and one that is often peculiar to their own traditions. Flamenco, tap dance, clogging, ballet, Irish step, English clog; they all have shoes that have evolved alongside the dance form and are very particular to it. Often the shoe designs have been created to get a particular sound and/or visual style and in turn, the design of the shoes has shaped how dancers dance. At the same time, many styles do not rely on specialized shoes, and can be danced in many different types of shoes (although some dance forms came into being at least in part because of footwear for particular workplace environments). As someone who enjoys studying, performing, and teaching multiple forms of percussive dance, I have a perspective that is not specific only to one form, but I am most concerned with shoes for tap dance and American flatfooting and clogging. A lot of finding the right shoe comes down to personal preference, and it make take some trial and error to figure out what you like. I usually tell anyone who is just starting out, “get something comfortable with a leather sole.” This is a little vague, so to be more exact, lets say an all-leather Oxford style shoe. I like cap-toes, but wing-tips, brogues, etc. should be fine. You want something that is comfortable and makes a good tone on the floor. You’ll get a deeper, richer sound if that leather sole is extra thick (look at the side of the sole and look for at least two thicknesses of leather glued or stitched together). I try for the sole to be 1/4″-3/8″ thick. This thicker sole will allow the shoe to do some of the work for you and you won’t have to work so hard to get a good sound. I love cruising the secondhand shops for old dress shoes. Then I take them to a cobbler and get extra leather put on the bottom. Going this route you can get a good pair of multi-purpose dance shoes that will work for clogging, tap dance, sean nós or flatfooting, as well as social and partner dancing for as little as $30 if you can find the right cobbler to do the resoling. But what about the taps? 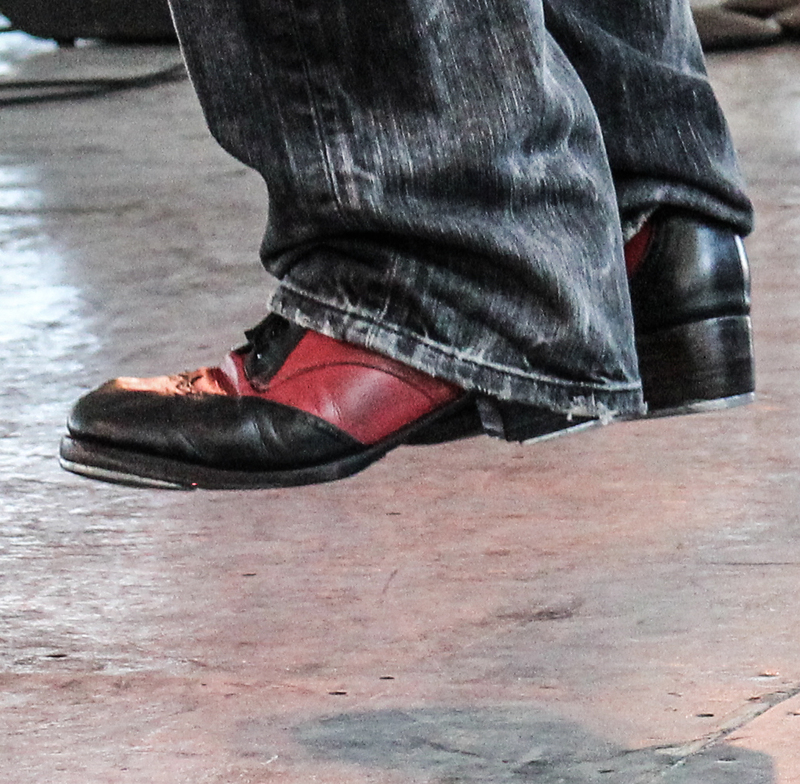 Shoes with taps on them are good when you may not otherwise be heard, and they do give you great clarity of sound, but taps can also be a little overbearing if you are dancing with acoustic music. A leather-soled shoe has the potential to be a subtler instrument. That said, anyone who is performing with any regularity will probably want both (I usually make a last minute shoe-decision based on the floor, the acoustics, the size of the room etc.) If you do an outdoor show in front of a big crowd, there’s a good chance that your tasty leather-on-wood sound will get lost unless you have a good mic and the sound person is really good at their job. Another great tap shoe is the Bloch Jason Samuels Smith. For about 175, these are a very reasonably priced option, and probably the best “pro” quality tap shoe I have found without spending around $300. They come with taps already attached (and they are not easily removed) which is either a plus or minus, depending on what you are looking for. They are heavier than other shoes I have tried, and the taps are bigger. This takes some getting used to, but I found them to be excellent once I got used to the extra weight. As far as leather-soled shoes for clogging, flatfooting, social dance, etc, (other than the thriftstore trick above) I have found two that are a bit more affordable than the above options but are still good shoes. The first is the Aris Allen. The sole is not as thick as you might want for percussive dance (they are perfect for partner dancing) but a good cobbler can easily fix you up with a thicker, heavier leather sole. Once you factor in this additional expense, you are almost up to the cost of the Bloch shoe above, but if you want shoes without taps, they are a very good starter shoe. They may not last quite as long as some of the other choices discussed above, particularly if you dance a lot, but for students on a budget, they are a great option. Slightly cheaper still are these “Clogging Oxfords.” These are not as swanky as the Arris Allens, but they have a good hard sole that will make decent sound, and have the benefit of being the most affordable. If you already have shoes and are looking to put taps on, Capezio, Sansha, Bloch, and others all make different styles of taps that are slightly different sizes, so you may need to experiment to find what fits your shoe and foot best. I have slightly wide feet and have found the Sansha taps to be a better fit than the narrower Capezio taps. 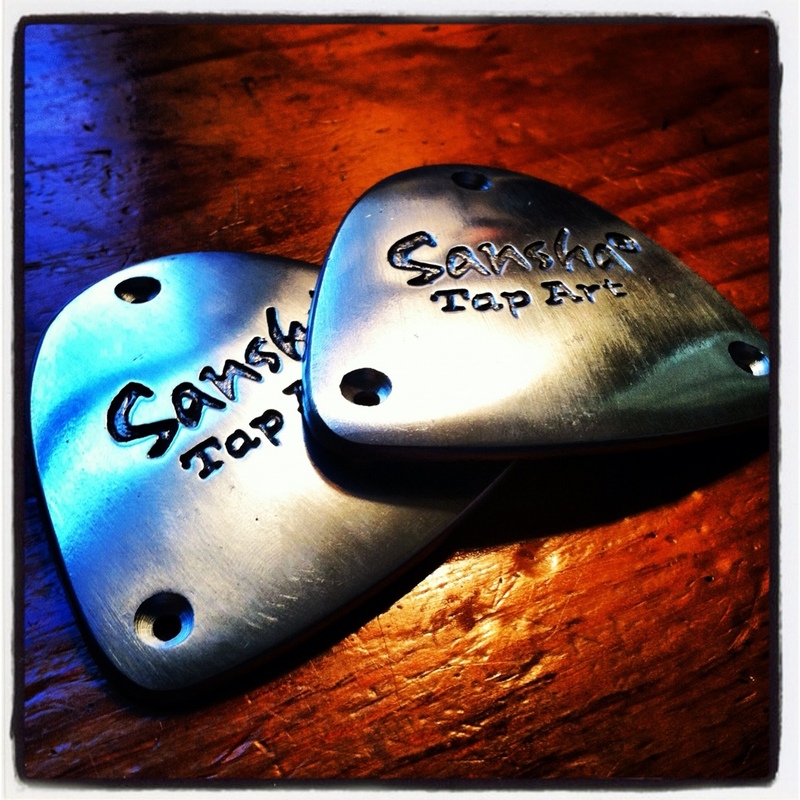 The Jason Samuels smith taps are the widest, so if your shoes are wide these may be a good option. Lastly, I have yet to try Miller and Ben’s and some of the other brands out there so I am not including them here, but that is only because I can’t speak from experience. What does all this mean? Well, you have options. It really depends on what you you want the shoes to do. My vote is to throw down the dough for the Just Taps. Your feet will thank you. ~ by matthew olwell on March 7, 2014. Charmaine Slaven hooked Ben Power up with wooden taps. You might also ask Maldon because she’s working with a friend to set up wood taps she likes. This is Christine, then-Fry-now-Appleberry who lived at the farm in the camper one summer many years ago. In another message, I�m sending you a contact for a woman who has been making wooden taps for many years. Thanks Christine for the lead on the wooden taps, and for the lovely compliment! Great to hear from you again. Look us up if you are ever in Elkins. You should come to Augusta! I�d like to introduce you to Kalia Kliban, a woodworker, clogger, and sword dancer from Sebastopol, California. She makes wonderful wooden taps and has for years. She helped my husband, Kim Appleberry, make some for his dance shoes and they were one of the things that tipped the balance on saying �Yes� to living with him for the rest of our lives. She does beautiful work. Thanks Kalia! I’ll drop you a line with some more specific questions. Other than Just Taps, where can I find tap shoes for a men’s size 13/14? It has been tough to fin tap shoes for big feet! These are actually more expensive than the Just Taps, which I think are a superior shoe, just FYI. Hi! I’m a french tap dancer! I’m looking for wooden taps… I have an idea about mixing tap shoe and french traditionnal folk dance shoe… Did you finally find somebody? any tips? Thanks! Sorry to not respond sooner, don’t know how I missed this! A woman named Kalia Kliban who lives on the west coast made me a pair of wooden taps. PM me if you’d like her contact info. I just found this thread and I too am interested in getting wood taps. I just bought Charmaine Slaven’s DVD and I think the taps would be add more to the experience. Any help is greatly appreciated thank you.